Home Politics Did ‘Empire’ Star Fake Chicago “MAGA Country” Attack With Two Extras? Did ‘Empire’ Star Fake Chicago “MAGA Country” Attack With Two Extras? Update2: The writers of Empire tweeted that they have “never planned or even discussed” writing Smollett off of the show. The writers of Empire have never planned or even discussed writing @JussieSmollett off of the show. Update: According to Chicago PD spokesman Anthony Guglielmi, media reports about the incident being a hoax are unconfirmed by case detectives. Chicago PD called ABC 7 News to report that Smollett is considered a victim and the police investigation is ongoing. Empire star Jussie Smollett may have staged a hate crime with two extras because his character was being written off the show, reports Rob Elgas of Chicago’s ABC 7, who has covered the case extensively. Smollett was reportedly a no-show for an interview earlier today with detectives. Earlier Thursday, TMZ reported that police raided the home of two men who police arrested at the O’Hare Airport Wednesday night. According to WBBM TV reporter Charlie De Mar, the two men are Nigerian and were extras on Empire. On January 29, Smollett said he was attacked at 2 a.m. outside of a Chicago apartment building after walking home from a Subway. Smollett said he was attacked by two men in ski masks who shouted racist and homophobic slurs, and said “This is MAGA country” during the assault – a claim the Empire star failed to mention in his initial police report, yet said his manager says he heard over the phone. Smollett eventually turned over heavily redacted phone records to the Chicago Police, after he and his his manager, Brandon Moore, claimed they were on the phone during the attack, and Moore heard the “MAGA Country” phrase. He said the attackers then doused him in bleach and put a noose around his neck, which he was still wearing as he walked back into his Chicago apartment – along with the sandwich. Questions were raised over Smollett’s story – including by Smollett’s neighbors. “I don’t believe it happened the way he said it did,” said neighbor Agin Muhammad who lives in the same building. Jussie Smollett Update: According to @CBSChicago Police raided homes of 2 Nigerian actors who appeared on Empire with Jussie. The police took evidence from the homes and still have them in custody for questioning. Definitely not the white MAGA attacker narrative pushed by media. Look what we have here. @DonaldJTrumpJr was right about Jussie. Extras? Extra what.queers? 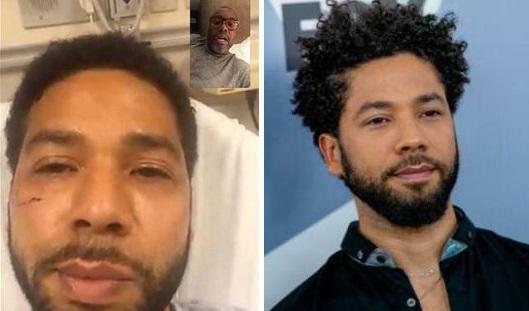 At any rate it does look like he got cracked on the side of his smollett. He’s close friends with maxine waters, so, really, is he credible at all? The whole assualt incident alleged by smollet was a poorly crafted lie. But for what reason? Only smollet and his accessories know. The question now is how many laws did smollet and his accomplices break and will they be charged and prosecuted? Probably no charges; after all, he’s gay and black which will give him a free pass. And also, he’s probably democrat. I doubt Kummela Hairy or Joeblow Biteme either one had ever heard of toilet before this charade. I know I hadn’t. When we do not punish people for abusing the system. then the system is broke. He is a RACIST ! ! ! ? THE POLICE HAVE TRACKED DOWN THE ROPE WHICH WAS BOUGHT AT ACCE HARDWARE AND THE EXTRAS WERE THE ATTACKERS!! This getting MORE SUSPICIOUS all the time. Wouldn’t surrender his phone to police……kinda fishy. Two Nigerians shouting MAGA……really?? FAKE! !